This dish uses the risotto method to cook quinoa instead of Arborio rice. I prefer quinoa to almost all grains for its nutritional benefits and texture; it’s also an easy gluten-free substitute. The salty taste of the Parmesan complement the sweet cranberries, making this a dish I will repeat every Fall. Put chicken stock in a sauce pot on medium heat to that it stays warm. Saute onion and quinoa with a little bit of butter until you can start to smell the quinoa. It will smell like toasted nuts or popcorn. Add pumpkin and 1/3 of the chicken stock, stirring it until it absorbs. Add another 1/3 chicken stock, again stirring until it absorbs. Add remaining chicken stock, covering until quinoa is cooked fully. This is a good stopping point if you wish to prepare ahead of time. Add milk, cheese, and half of the cranberries and walnuts. Stir until melted and fully absorbed. Season with salt and pepper to taste. 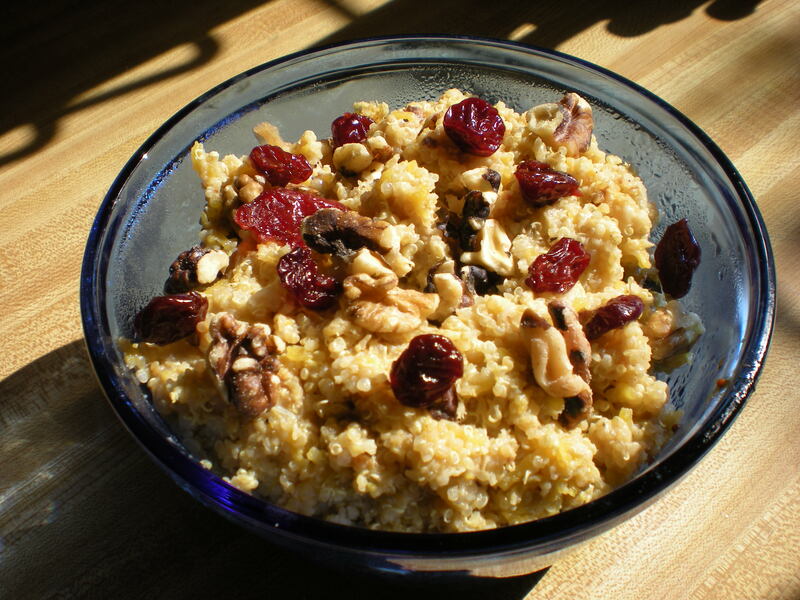 Put into a serving bowl and top with remaining walnuts and cranberries. ** Cut a sugar pumpkin in half and coat with olive oil, salt, and pepper. Cover with tin foil and roast at 375 degrees for an hour or so, until it comes out easily with a fork. Set aside to cool. Pretty sure this has my name all over it…cant wait to try it! !